← Can of worms = open. 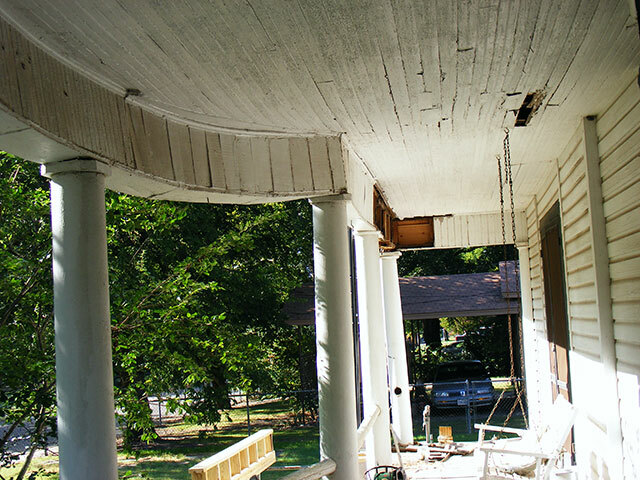 So, in my epic quest to actually GET STARTED on the front railings…I’ve begun to tackle the structural issues on the front porch. I want this stuff to be straight when I add railings. 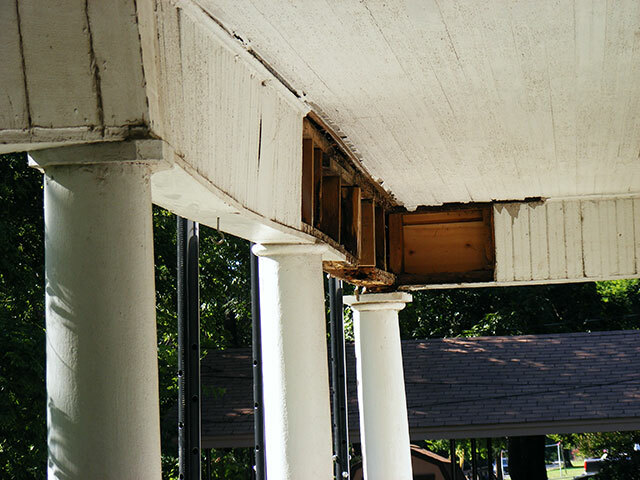 Here’s what I’m up against…the porch header is a box-beam that’s suffered damage over its lifetime and been poorly repaired. You can see its minor case of “wompy-jawed-ness” (that’s a technical term). No way I can just add braces or repair rot and call it good/straight. I’m basically jacking up the roof, cutting out the box beam (it’ll actually probably mostly fall out), building a new box beam, and installing it. I’m doing this in sections (once column set at a time) for manageability and so I don’t have to buy a couple thousand bucks worth of jack-posts. That’s 10 feet, center to center on the columns. I didn’t want to remove all the old stuff till I had the new ready to go back in, so that the least time possible is spent with the jack-posts being the only support. Just being cautious. The beam, minus it’s coverings, is 15″ tall by 5-1/2″ wide. I figured it would be easiest to replicate that size so I don’t have to replace or modify the curved section to match it when I get there. 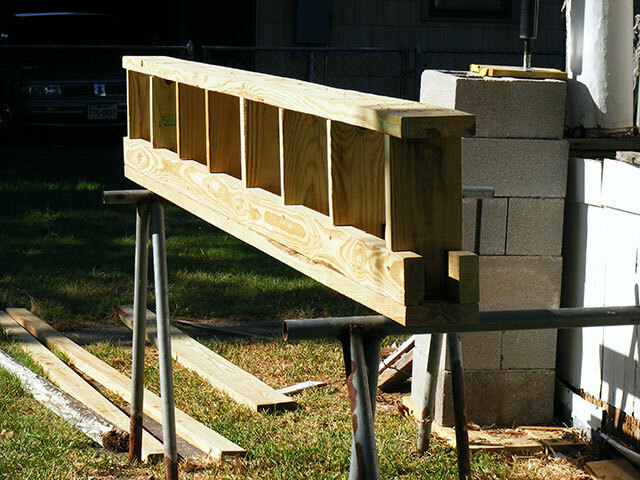 I built a new box-beam…this is for the first 10 foot section. I wanted something a little beefier, without getting carried away since what was there actually held for 100 years or so. “Beefier” helps me pull everything back into line and get it all straight. I hope to insert this beam tomorrow. Then I’ll do the next 10 foot section. The curved beam actually looks pretty solid…I’ll know more when I get to it…but it is over 4″ down in the center and will take some work to get it all leveled back up. That will for sure test its “okay-ness”. So far I’ve not broken anything, killed anybody, or found anything I can’t handle.